Since 1989, Blair’s Death Sauce has been a leader in the hot sauce world. 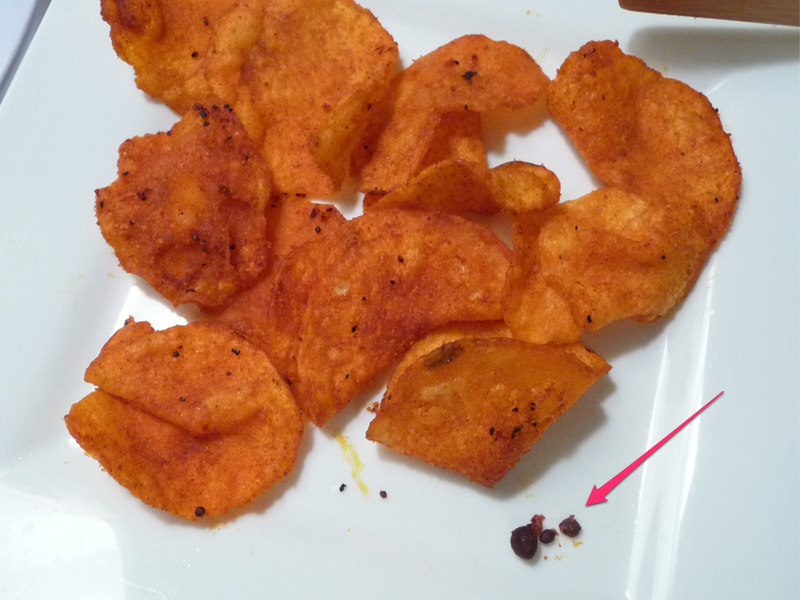 His newest offering is Blair’s Jolokia Pepper Potato Chips. Cauldron™ Cooked chips are coated with Blair’s fiery Jolokia pepper seasoning along with the warning that these chips are for “experienced Chiliheads only”. Scary, but not to worry… they are very flavorful and very edible. These are the “World’s Hottest Chips”. So they say. We opened a bag of these red hot chips, munched down on quite a few, and have included our thoughts below. They are fiery, hot, and delicious. Ingredients: potatoes, sunflower oil, and/or corn oil, spices (including jolokia pepper and paprika), salt, dextrose, dehydrated garlic, natural flavors, spice extractives (including paprika). Texture & Appearance: These “Cauldron™ Cooked” chips have the typical texture and crunch of kettle style cooked chips. +1 points for the use of the phrase Cauldron Cooked instead of Kettle Cooked… marketing genius. Taste Straight Up: – Sweet, salty, savory… then the heat kicks in. 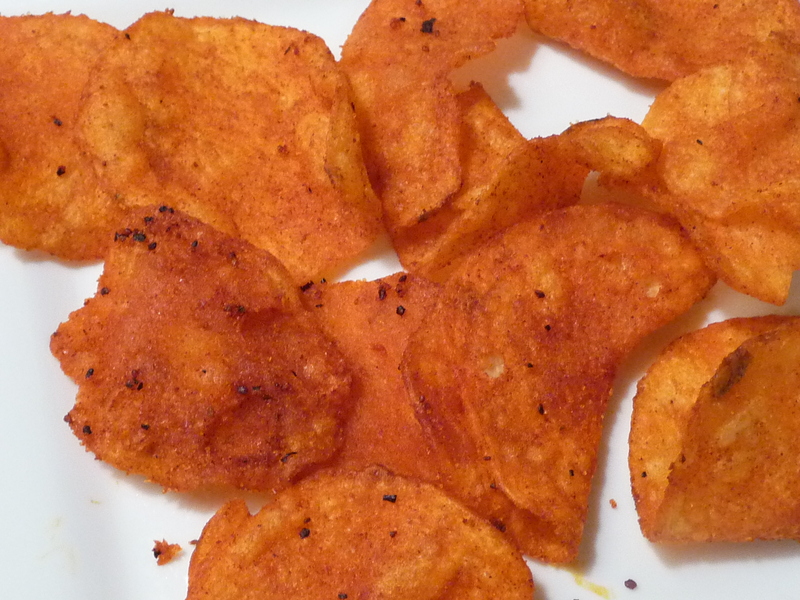 Our informal panel of 3 each had a different reaction to the heat and flavor of these fiery chips. Subject One (Son) said they were the hottest chips he’s ever had. Subject Two (Marilyn) said they were way hot but flavorful. She went back for second and third helpings. Subject Three (me) ate a bunch. We all craved more. These are delicious and addicting. Heat Level: – The consensus among us is 4 out of 5. They fall just below the hottest freakin’ snacks or chips we’ve ever had. Label/Graphics:< – Another stellar package from Blair’s – FEEL ALIVE! 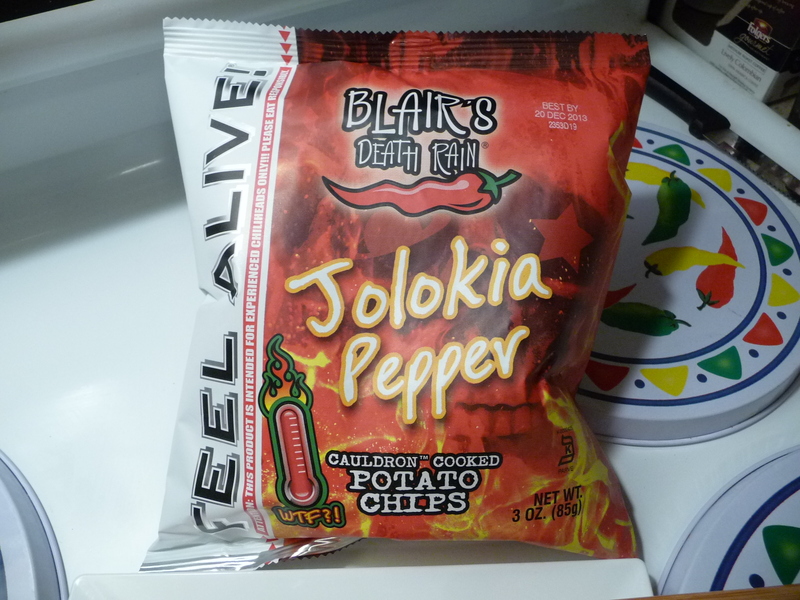 is emblazoned along the side of the bag – Blair’s Death Rain is the heading, and Jolokia Pepper is prominent on the front. Subject One (Son) was digging the WTF?! Heat Thermometer in the graphics. Overall Rating (Taste on Food, Final Thoughts): – I’m going to stay away from our highest rating of 5 ONLY because we don’t care for kettle cooked chips here at the HotSauceDaily household. These hot, savory snack chips would garner a higher rating if they were on your normal potato chips. But the flavor and spice of these chips is amazingly good. Bonus Content: See those little pods of chile goodness? Save them and the crumbs and dust from the bag. They will make for a great seasoning for french fries! I came home today and helped myself to more. Thanks Blair! I now have a new addiction! Hey Brian Glad to see you enjoy the Fire as much as I do Much respect to you for doin what you do with passion. Feel Alive. Your ChiliPal B ! Blair, I think you nailed the seasoning perfectly! If you could package that spicy goodness in a shaker bottle, it would be a big deal. What are the hottest chips you have had? I think these are by far the hottest chips we’ve ever had. How about you Chris? Taste great. Seasoning is good, but on spicy level, I would give it a 1. Not comparable to the real thing. Oh gosh, no way this chips are as hot as the sauce probably is. I say even though I’ve not tried the sauce personally. That would be way to hot for me. Thanks Kevin! I just fell in love of these. Although I wish they had a little bit more of a kick. At the end of the bag where you just scrape a pinch of the remains, that gives you the kick and dread you were looking for.